Phil Roberts, Rick Reitveld, Jeral Tidwell, Drew Brophy, John Bell, Miles Thompson, Damian, BigToe, Mr.G, Doug Dorr, Grimb, Steve Caballero, Ken Ruzic, Dave Lozeau, Bamboo Ben, Fudemae, Max Grundy, Aaron Kraten, Fudemae, Squindo, James Mcleod, Keith Ciarmello, The mysterious 13:11, Dirk Hays, Buddy June, Crazy Al, Scott Aicher, Chongolio, Doug Horne, Atomic Kitty, Justin Barry, Chainsaw Chuck Majewski, Von Poot, Dale Sizer, Nik Scarlett, Dark Vomit, Paul Torres, Joe Vitale, Bob Penuelas, Augie pagan, Mike Sosnowski, Tiki ray, TV-1, Ryzart, The Pizz, Brian Viveros, Link David,ET.7 and many more talented artists from all over the globe! The collision of artwork featuring surfing and hotrod cultural influences may seem like a recipe for disaster. 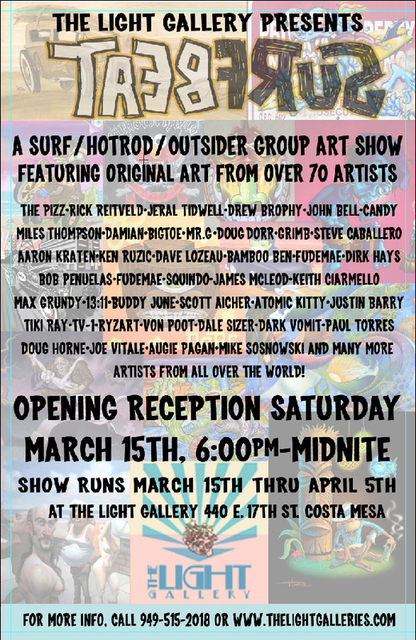 But in the case of SurfBEAT, the Light Gallery in Costa Mesa is putting together a tasty occular feast sure to please the most discriminating devotees of “outsider art”. Surfing and hotrod cultures, along with fascination with the decadent psuedo-polynesian tiki culture, all blossomed in the 50s, when hipster baby boomers explored their sense of individuality and rebellion. They offer in common today, as they did then, a haven for outsiders, folks disenchanted with the promise of main-stream media and the American Dream. In the art world, the academic and traditional gallery communities have been slow to warm to the allure of the art produced by these outsiders. Artwork inspired by surfing, hotrods and tikis, in all its forms, revels in It’s representational depiction of familiar cultural icons of the “wrong side of the tracks”. This aesthetic has been shunned by the leaders of the “high-brow” art world. SurfBEAT features a broad cross-section of what is collectively referred to as “lowbrow” artists. From world-renowned to local heroes: Surf artists, Animators, Hotrod air-brushers, tattoo artists, skateboard artists, concert poster illustrators, tiki carvers, pin-up photographers and sundry ne’er-do-well artists converge in a celebration of decadence sure to titillate and amuse all but the most puritanical pillars of the community.